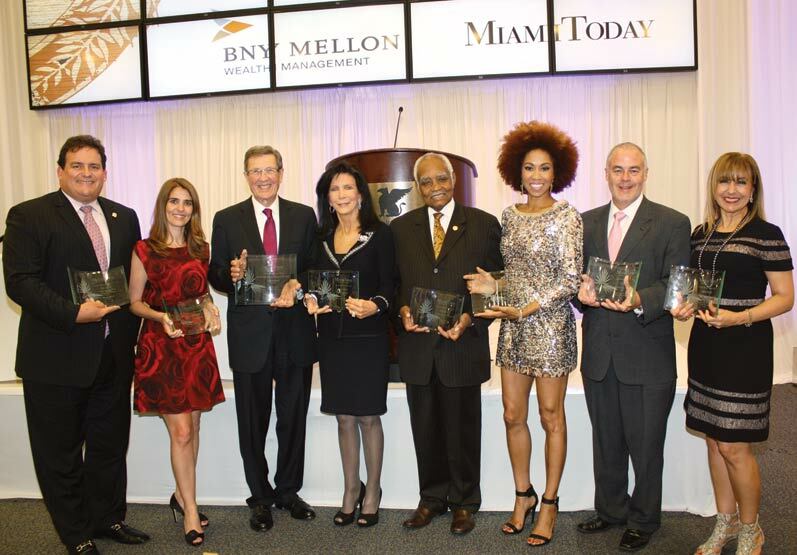 Four accomplished individuals and three prominent organizations accepted Gold Medal honors highlighting their outstanding contributions to Greater Miami at Miami Today’s 14th Gold Medal Awards dinner. Attorney Aaron Podhurst accepted the Lifetime Achievement Award for his work in the community. Seven judges selected the Gold Medal Awards winners from more than 55 victors in local and national competitions that were held last year – only top-level award recipients were eligible for consideration for the Gold Medals. Miami Today and dinner sponsor BNY Mellon Wealth Management chose Mr. Podhurst for the Lifetime Achievement honor. In balloting for the top organization, the judges selected Miami Dade College for the Gold Medal based on a long list of nationally recognized awards the college had received last year. Juan Mendieta, the college’s director of communications, accepted the award from Hector Brito, sales manager at sponsoring Mercedes-Benz of Coral Gables and Mercedes-Benz of Cutler Bay. The Gold Medal for an individual went to a leader in community philanthropy and volunteerism, Trish Bell, also chosen for a long list of accomplishments. She accepted the award from Miami Today Vice President Carmen Betancourt-Lewis on behalf of Armando Codina and sponsoring Codina Partners. Habitat for Humanity of Greater Miami won the Silver Medal for an organization. The organization’s CEO, Mario Artecona, brought out smiles from the audience as he asked the crowd to wave at the podium as he took a photo of them – a photo he distributed the next day to participants. Presenting the award was sponsoring Greenberg Traurig’s Co-chairman Cesar Alvarez. Habitat for Humanity was nominated based on its success in building 163 houses in Liberty City for low-income residents, a feat that won the organization the Greater Miami Chamber of Commerce’s REAL award for affordable housing. The Silver Medal for an individual went to Florencia Tabeni, general manager of the JW Marriott Marquis and Hotel Beaux Arts Miami, which by coincidence was the site of the April 10 awards presentations. The JW Marriott Marquis was named tops in guest satisfaction by the Marriott group last year. Presenting the award was Chris Gandolfo, vice president of development of Swire Properties. The Bronze Medal for an organization went to WPBT2’s “art loft” television series. Accepting the award were Neal Hecker, chief content officer at WPBT2; “art loft” producer Kandra Valez; host of ‘art loft” Kalyn James, and independent producer and contributing producer for “art loft” episode 117 Marlon Johnson. Presenting the award was Irene White, director of operations support of sponsoring Florida Power & Light. The television series was honored after receiving an Emmy for its innovative program. Two Bronze Medals were awarded to individuals after judging resulted in a tie vote. Col. Hartley this year will celebrate 30 years running Community Health of South Florida. He was nominated for the award based on a long list of honors that he received last year. Ms. Becerra-Fernandez for the past two years has been Florida International University’s vice president of engagement. Last year she was honored with the Great Minds in STEM Educator-Administrator of the Year award. Mr. Podhurst, in accepting the Lifetime Achievement Award, used his appearance at the podium to underscore that only in the United States could an immigrant family received the opportunities that his did, encouraging him to give back to a land that had opened its arms to his parents. He was recognized for being a distinguished trial lawyer for more than 50 years in Miami, a long list of philanthropic activities, his service as chairman of the board since 1998 of what is now the Pérez Art Museum Miami, and a long series of career honors for civic and professional achievements. Joe Fernandez, Florida president of sponsoring BNY Mellon Wealth Management, presented the Lifetime Achievement Award to Mr. Podhurst. Judges who selected the Gold Medal Awards were Susan Amat, founder of Venture Hive; Sheldon Anderson, chairman of the Beacon Council; Al Dosal, CEO of Dosal Capital and chairman of the Greater Miami Chamber of Commerce; Wendy Kallergis, president and CEO of the Greater Miami and the Beaches Hotel Association; Mark Rosenberg, president of Florida International University; William D. Talbert III, president and CEO of the Greater Miami Convention & Visitors Bureau; and J. Antonio Villamil, CEO of the Washington Economics Group. νThe importance of achievements for which nominees had received awards in the past year and the stature of the recognizing organizations. νThe long-term impact of the honorees’ achievements on this community. Miami Today 15 years ago established the Gold Medal Awards to honor The Best of the Best, choosing among those that already had received from peers top honors in a vital category in the prior year. Last year, in place of the Gold Medals, the newspaper celebrated its 30th anniversary by honoring 30 living Miami legends and 10 past legends. Trophies were presented after an invitation-only reception and dinner for 120 guests on the 19th floor of the JW Marriott Marquis downtown, which has been the home of the past three dinners. Past Gold Medal Award winners, competition judges and leaders in business and education, as well as an international delegation of consuls general, attended to salute the honorees.